Opposition candidate John Atta Mills is heading for the Ghanaian constituency which will decide the closely fought presidential run-off. The remote western constituency of Tain will vote on Friday with the presidential contest on a knife-edge. 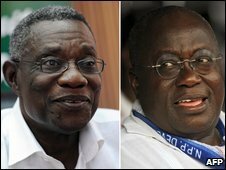 It has some 54,000 voters, with Mr Atta Mills leading his rival Nana Akufo-Addo by just 23,055 votes nationwide. Both men's supporters have complained of fraud but the electoral commission says no evidence has yet been produced. "They have not filed any appeal in the strict sense of the word," Kwadwo Sarfo-Kantanka from the electoral commission told the BBC's Focus on Africa programme. The announcement of the winner has been delayed until after results come in from Tain and the allegations of rigging have been investigated. Mr Sarfo-Kantanka said he thought the result would be declared late on Friday. 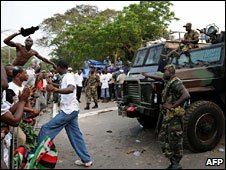 Ghana is one of Africa's most stable democracies, with peaceful handovers of power. But the close race, fraud allegations and the increased stakes with the discovery of oil off the coast have raised fears of possible violence. Mr Atta Mills' spokesman Mohammed Ayariga told BBC News that there was unlikely to be a big rally in Tain, as it was such a remote area and there was not much time to organise one. He said that former President Jerry Rawlings - under whom Mr Atta Mills served as vice-president - had already travelled to the constituency to lead the final campaign. Security is being tightened in Tain ahead of the crucial poll, police chief Patrick Kwarteng Acheampong told the local TV3 station. "We intend to saturate these polling stations with quite a sizable number of police officers backed by our military counterparts as reserves," he said. Mr Atta Mills won the area in the first round of voting on 7 December so his National Democratic Congress (NDC) is confident of victory. "It's a done deal... this Tain election is an academic exercise," party national organiser Samuel Ofosu Amposo told the BBC's Network Africa programme. He called on Mr Akufo-Addo to concede defeat. But the governing New Patriotic Party says the outcome is still too close to call, especially with the possibility of some results being disqualified because of the fraud claims. "In any re-run, people can change their minds, they can vote any way they want," said NPP general secretary Nana Ohene Ntow. The NPP said its election agents had been chased away from polling stations in the Volta region, making results there open to question. The NDC complained of alleged irregularities in the Ashanti region - a stronghold for the governing party. Electoral commission chairman Kwadwo Afari-Gyan on Tuesday said Mr Atta Mills had won 50.13% of the vote, while Mr Akufo-Addo had taken 49.87%, with just the Tain result outstanding. This means 23,055 votes divide the two candidates, out of a total cast of some 9m. "Results are so close that the result of the Tain constituency could effect the eventual winner," Mr Afari-Gyan said. Tain, in the Brong Ahafo region, was unable to vote on Sunday because of a problem with voting materials. According to the Daily Guide newspaper, the ruling party had accused electoral officials in Tain of stealing about 1,820 ballot papers, which they claimed were given to the opposition. Some 12.5 million people were eligible to vote in the election - the fifth since Ghana's return to democracy in 1992. President John Kufuor is standing down having served two consecutive terms. In the two previous elections he defeated Mr Atta Mills. Monitors hope Ghana's poll can help salvage the tarnished image of constitutional democracy in Africa, after flawed elections in Kenya and Zimbabwe and military coups in Mauritania in August and in Guinea last week. The stakes have been raised in these elections because Ghana has just found oil, which is expected to start generating revenue in 2010.